The Livin' in the Sun EP features fresh, fun music including everything from irreverent, humorous songs to emotional ballads. Written by Barbara Graff, a songwriter and pianist whose music is featured on several radio stations including Pandora Radio. The title track, "Livin' in the Sun," is about being in the moment and living life to the fullest. Appreciate all you have, including your family and friends. It's a warm, happy song that instantly calms the listener, brightens their mood and "makes their day." It’s a great way to start this enjoyable country EP! Following the first track are three irreverent, humorous songs with catchy choruses, sing-along lyrics and tap-your-feet beats. All the music is fresh and original sounding. The music will take you on a journey from uplifting and sunny to hilarious and ending with emotional ballads. The last track is a bonus pop song that is uplifting with country undertones, sung by versatile vocalist Maddie Finn. Maddie is a contestant on "American Idol" and received the "golden ticket" in the 2018 Season. Other featured vocalists are rising country stars Theresa Rose Riley and Sanner Wright along with Bluegrass band member Julia Conway. Most of the music is produced and mixed by Michael Seifert, a platinum award-winning producer who has worked with Colbie Caillat, Jason Mraz, One Republic, Rob Thomas, The Dave Matthews Band and Bone Thugs & Harmony, to name a few. Mastering done to perfection by Matt Troja, with two songs mixed and mastered by Chris Lieber. 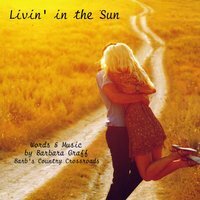 Music and words written by Barbara Graff, a songwriter and pianist whose music is featured on several radio stations including Pandora Radio. Barbara also plays piano and did the arrangement for the fifth track, "By My Side." She worked with co-writer and co-producer Austin Johnson on another selection, "Fifteen Minutes."